The Process Visualization Control 1 Learning System (T5552-S1) covers SCADA (Supervisory Control and Data Acquisition) that allows operators, technicians, and engineers to monitor and control process applications using sensors networked to equipment on the plant floor. These remote sensor readings are collected and displayed graphically in an organized way allowing process control decisions to be made. SCADA is used in many industries including power generation, petrochemicals, and manufacturing. The T5552-S1 connects to Amatrol’s Level/Flow Process Control Learning System (T5552) and PID Controller (T5552-C1) to allow learners to operate a real-world industrial control system. 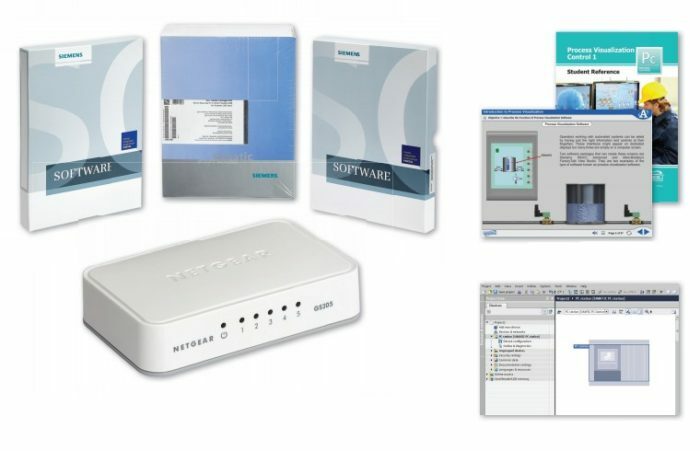 The T5552-S1 uses the popular Siemens WINCC software, a PC-based process visualization program that covers how to develop, program, and operate various types of SCADA functions using an Ethernet networked PC. In addition to hands-on skills, Process Visualization Control 1 includes highly interactive multimedia that provides a learner with the theoretical knowledge to understand how SCADA works and why it’s important in industry. Designed to connect to a PID Controller (T5552-C1) on Amatrol’s Level/Flow Process Controller system (T5552), the T5552-S1 uses an Ethernet network to communicate with a process control system via PC. Learners will use Siemens popular WINCC process software to operate, program, and monitor real-world process control applications on the T5552 and see how those applications are utilized in modern industry. More specifically, this software provides functions of SCADA that will produce easy-to-read graphical displays on the PC that will allow the learner to monitor analog and discrete inputs and outputs of the PID controller, perform basic control functions such as changing setpoints, and much more! Learners will interact with the multimedia curriculum as they learn how to configure the IP address of a UDC 3500 Controller. Major topics covered by this system’s multimedia includes the creation and programming of alarms, reports, messages, data collection, operator control input functions, and graphic process display objects; SCADA software applications, setup, configuration, and operation; OPC server configuration and operation; and Ethernet interface and communication to process instruments. The T5552-S1’s extensive multimedia curriculum combines text, audio, 3D illustration, and loads of interaction to fully engage learners as they are introduced to SCADA and all of its applications in process control. In addition to the T5552-S1, Amatrol offers learning systems that cover additional process control communication software, including HART Process Control 1 (T5552-H1) and Foundation Fieldbus Process Control 1 (T5552-FF1). This library of process control software learning systems offers you a range of product options to ensure that learners get the exact training they need. A sample copy of the Process Visualization Control 1’s Student Reference Guide is also included with the system for your evaluation. Sourced from the system’s multimedia curriculum, the Student Reference Guide takes the entire series’ technical content contained in the learning objectives and combines them into one perfect-bound book. Student Reference Guides supplement this course by providing a condensed, inexpensive reference tool that learners will find invaluable once they finish their training making it the perfect course takeaway.